The Ganapati Atharvashirsha is a most ancient Vedic Prarthana, which is dedicated to Shri Ganesha as the Ever-Existent One, the One who is sum total of Brahma, Vishnu and Shiva. By reciting the Ganapati Atharvashirsha, the practitioner practices the highest kind of Meditation on the Supreme Reality, symbolized by Shri Gaanesha. It is a tried and tested prayer for removing all kinds of Klesh, which in the context of this post means not only physical and mental strife, obstacles, discomfort and problems, but also ignorance and fear. In short, the dedicated chanting of the Ganapati Atharvashirsha will remove all kinds of poison from the system and replace it with mental stability, peace and auspiciousness. Prosperity and material benefits are also some of the by-products of this Prarthana. 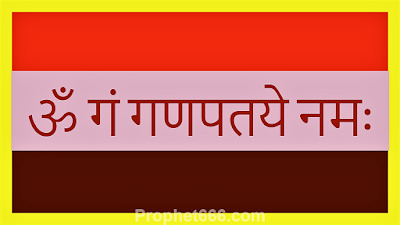 People having Paap Graha like Rahu, Ketu or Shani along with or conjoined the Moon in their Kundali can find the regular recitation of the Ganapati Atharvashirsha very useful. This Prarthana is also recommended for people showing symptoms of madness, delusions and extreme paranoia. Such people can overcome these problems with the regular practice of this Prarthana. The Ganapati Atharvashirsha can also be very useful for those students who have lost interest in their studies or who are unable to concentrate upon anything for long because their minds starts wavering and irrelevant thoughts keep on entering their minds. Sit down comfortably and recite the Ganapati Atharvashirsha, once daily, there is no need to perform any special Puja-Vidhi. It is recommended that the Ganapati Atharvashirsha should be recited 21 times, in the evening on the auspicious day of Sankashti Chaturthi, every month. Along with the regular recitation of the Ganapati Atharvashirsha, chanting the Ganesh Mantra- ॐ गं गणपतये नमः - Om Gan Ganapataye Namah, can also prove to be most beneficial. Note- If a woman is doing this Sadhana, she should take care to avoid doing it during her Monthly Cycle.